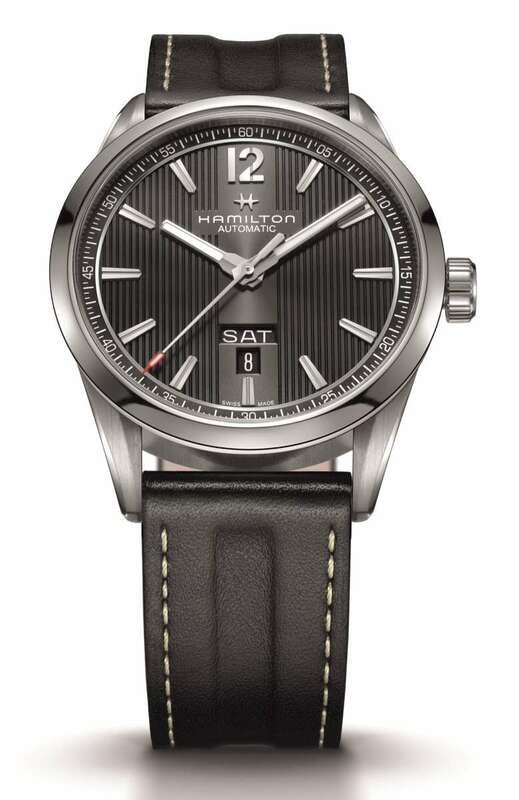 Hamilton Broadway Day-Date Auto 42mm, leather strap, reference H43515735, price €895. Available from June-July 2016. 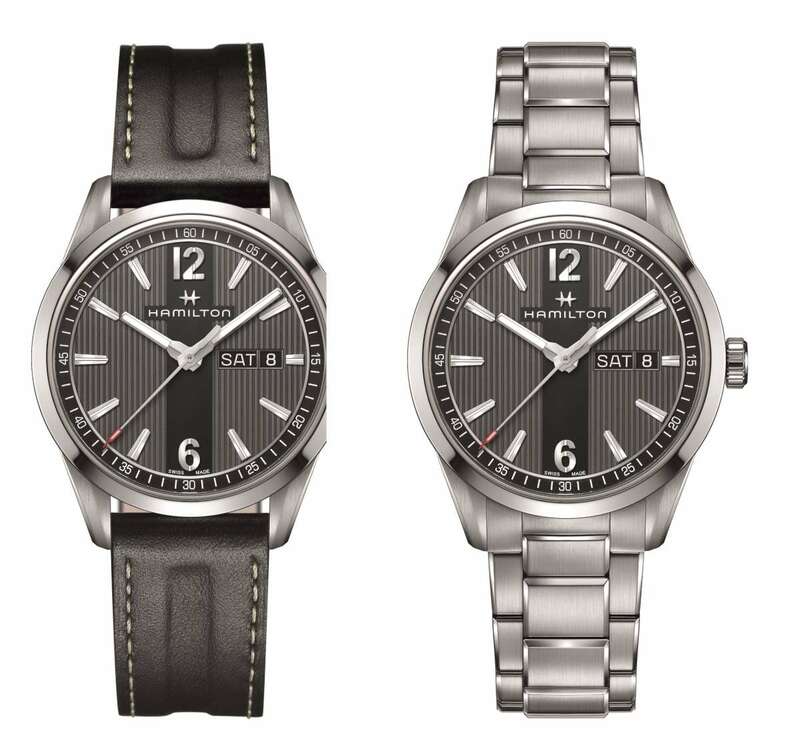 Hamilton Broadway Day-Date Auto 42mm, steel bracelet, reference H43515135, price €945. Available from June-July 2016. New for 2016, the Hamilton Broadway collection was inspired by New York’s skyscrapers, interpreted on the dial by narrow vertical ribbing. This range is a new addition, designed to fill a position somewhere between the military looks of the Khaki and the modern Jazzmaster models. An interesting feature is what looks like a slightly darker vertical line running along the strap (created by a slight depression in the leather) and vertically across the dial – recalling the street after which it is named. Several models are available, this three-hand plus day-date, the quartz version, and a chronograph versions, all with leather strap or steel bracelet. All of them have a seconds hand with a red arrow extremity. 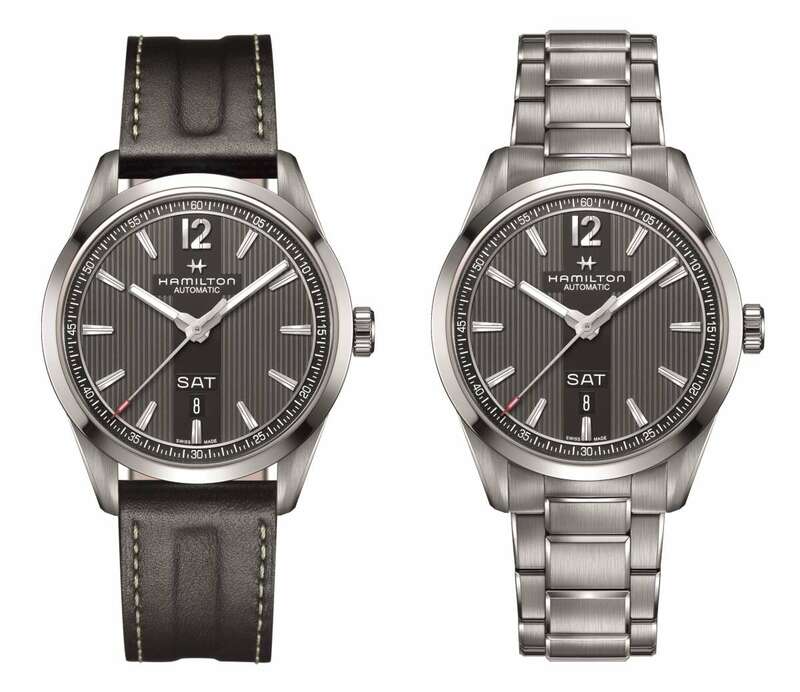 The Hamilton Broadway Day-Date Auto 42mm watch has an elegant, slim steel case, with alternating areas of satin and bright finish, and a narrow black PVD-finish ring between the case and bezel which adds extra visual refinement. The lugs have the characteristic Hamilton design. The day-date windows are positioned at 6 o’clock, heightening the symmetry of the piece. Day abbreviations are always in English. The case is waterproof to 5 bar (50 metres). 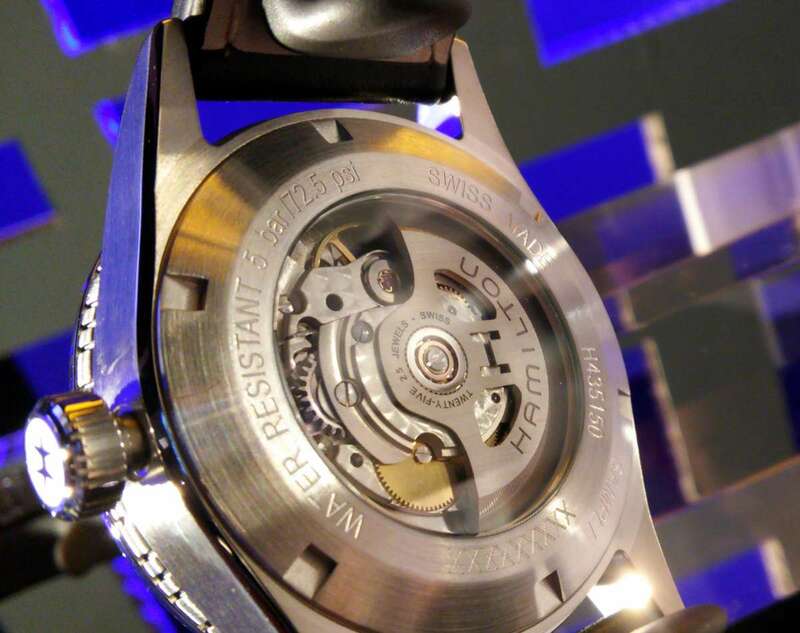 The watch is powered by the H-30 movement made by ETA exclusively for Hamilton. 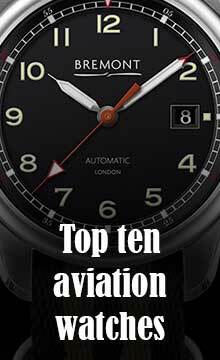 It provides 80 hours power reserve, and is made using exclusively traditional materials – in other words, no plastic components – and it is accessible to a watch repairer. The watch costs €895 in the version with leather strap, and €945 in the version with steel bracelet. Available from June-July 2016. 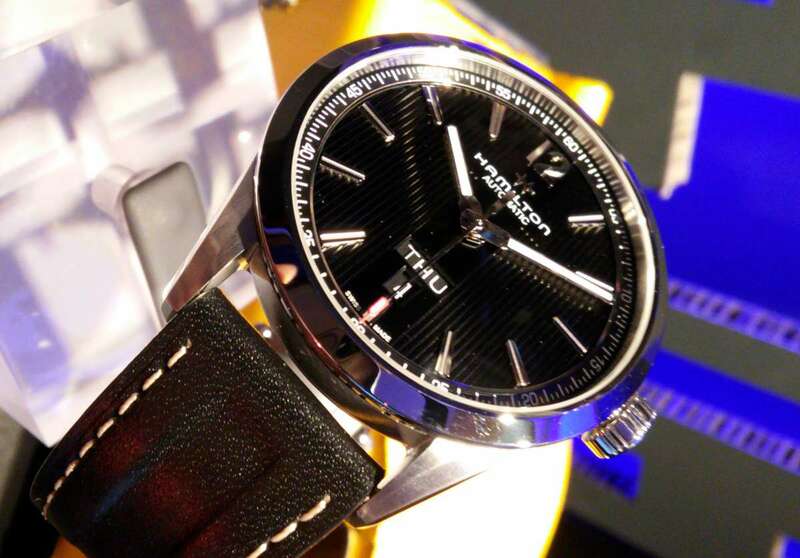 There is also a model with a quartz movement, at €525; this is smaller (40mm) and slimmer than the mechanical models, and it has a solid caseback with an engraving based on New York manhole covers. Available from June-July 2016.